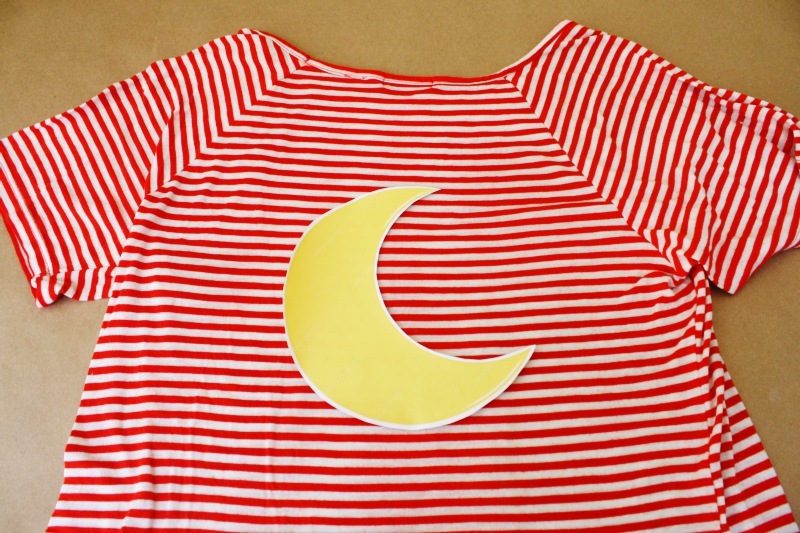 It’s a bird, it’s a plane, it’s a moon in my shirt! 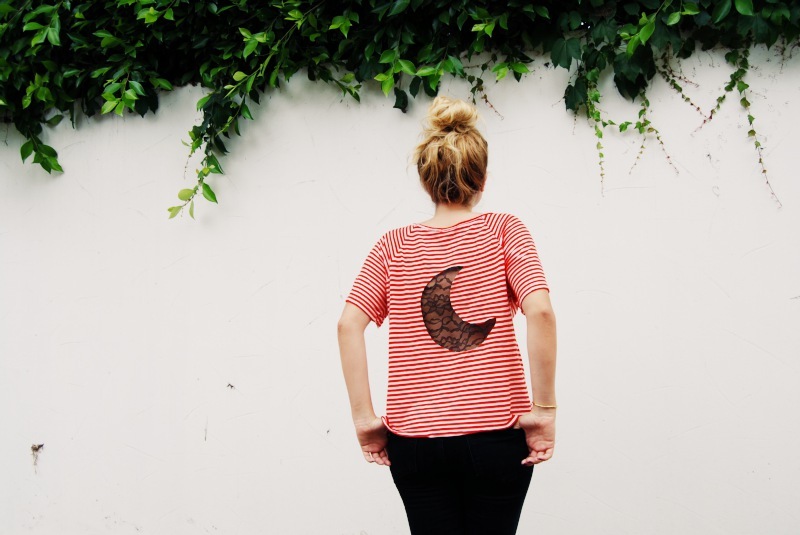 A DIY, lace-insert moon with no sewing necessary, that is. You know how I love hem tape and it’s iron-on nature which means I don’t have to take the sewing machine down from the really high shelf in my storage closet – so high I need Joey or a chair to reach. 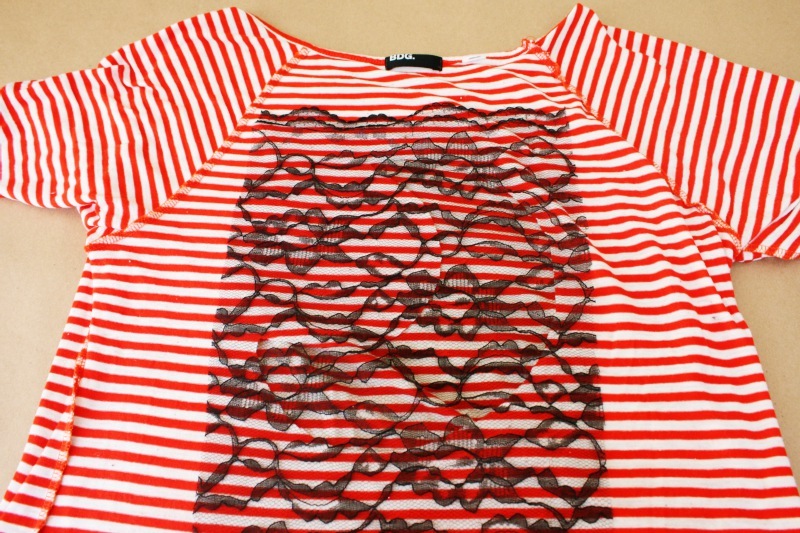 I also love lace and inserting things…mmmkay, I mean, I like cut-outs! 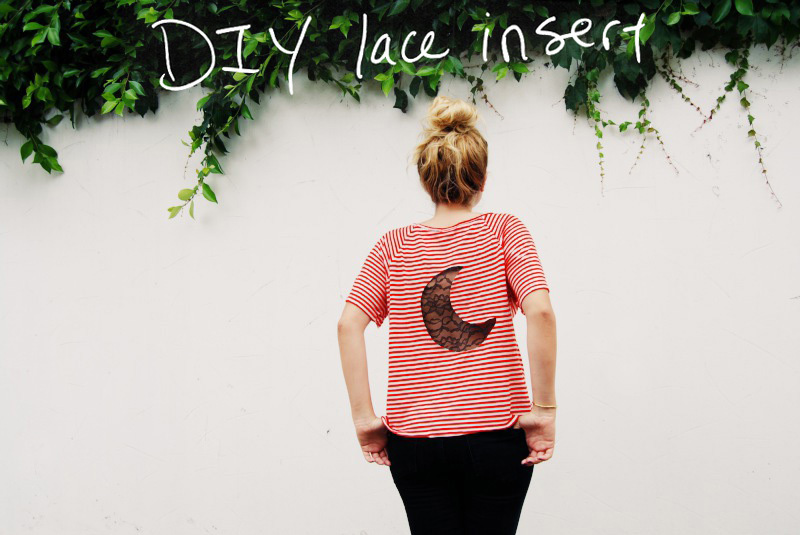 This is a great DIY to update/upcycle an old shirt, or any article of clothing (a jean jacket would be way cute too! 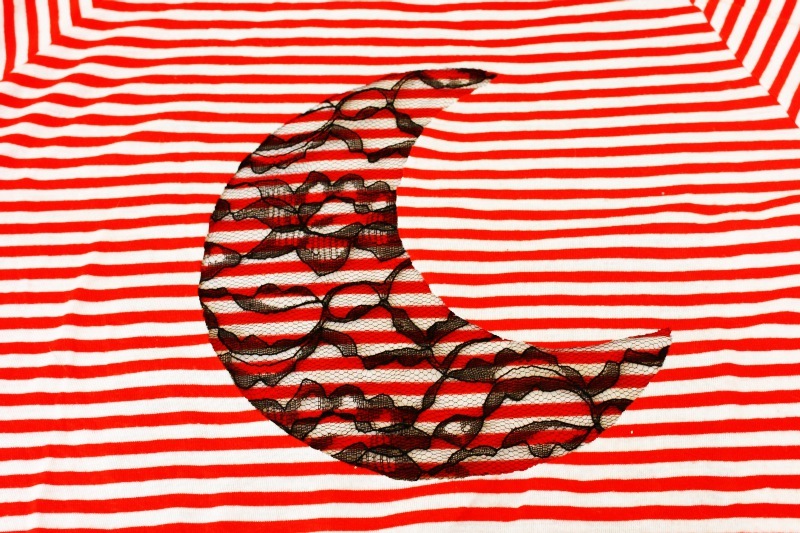 ), it’s good for warm weather for air flow, and of course you can do any shape you like…maybe a full moon… aka a circle. 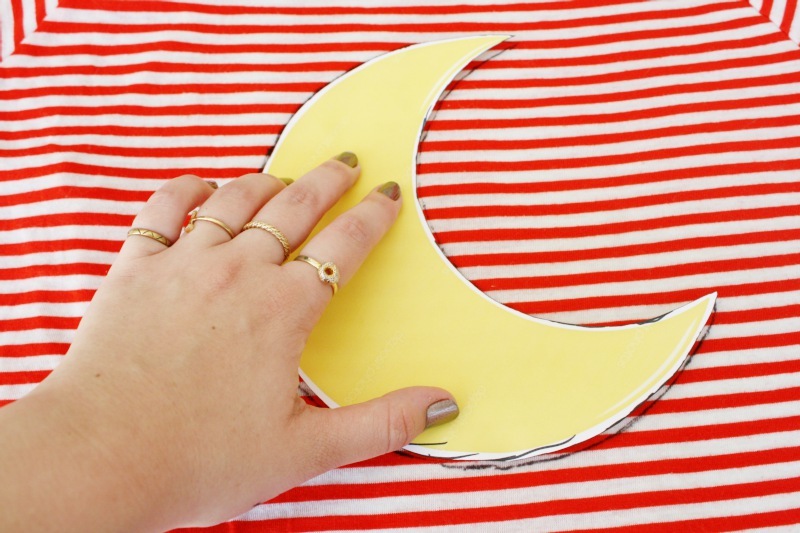 If you like this DIY, check out the DIY section on the blog for more ideas! 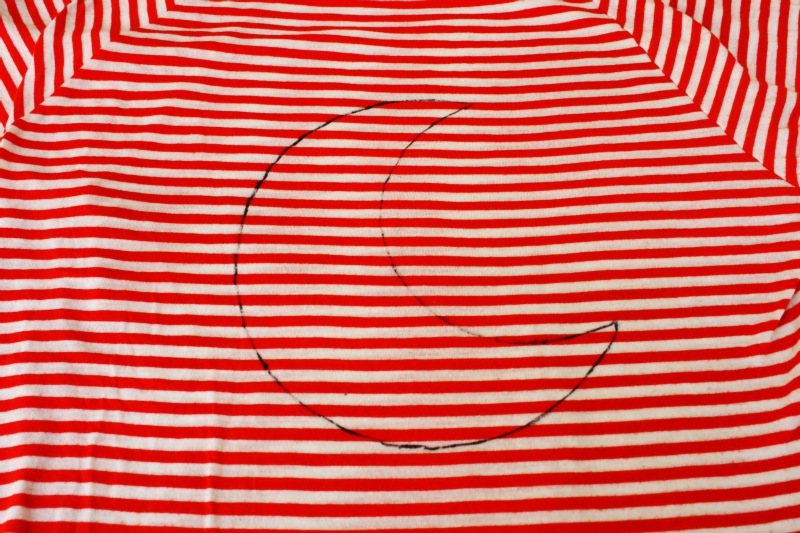 turn your shirt inside out and place the cut out picture or template of your shape on your shirt where you want the insert – **remember which direction you want the shape facing when your shirt is turned right side out again. 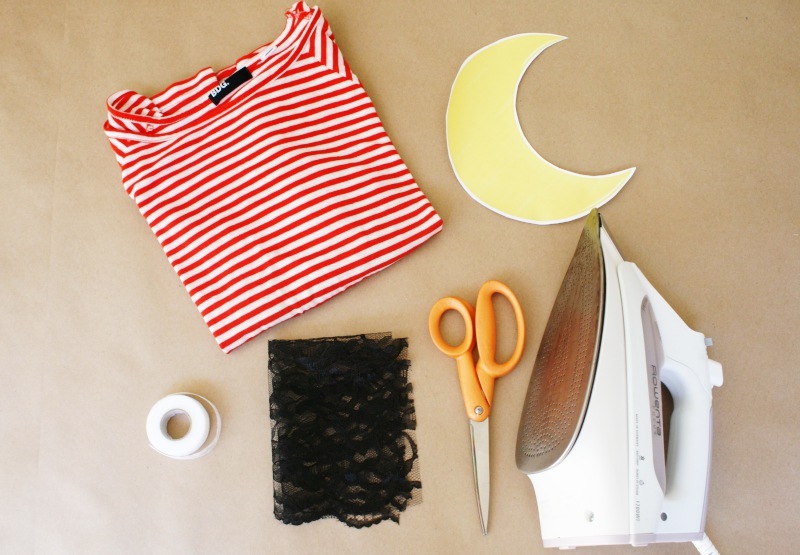 put the lace over the moon- make sure the moon is completely covered – we just cut a rectangle of lace – no need to make it the exact shape since it’s on the inside of the shirt. 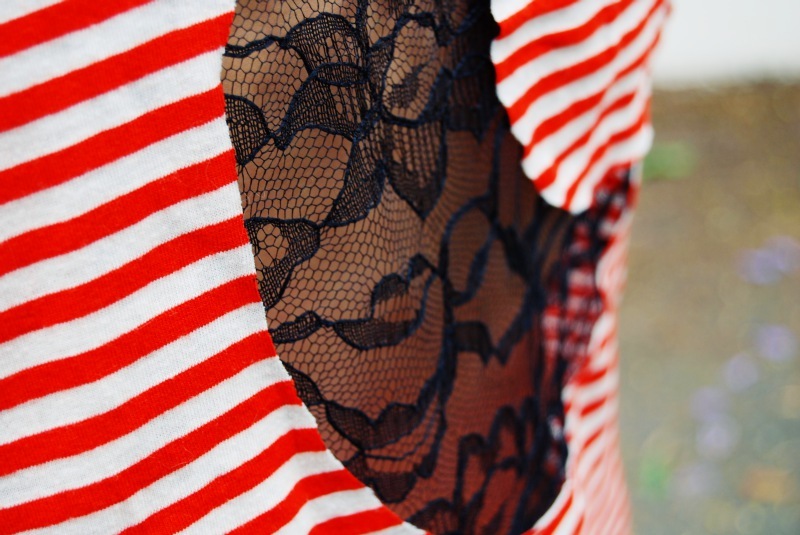 **you want some overlap of the lace to adhere with hem tape. 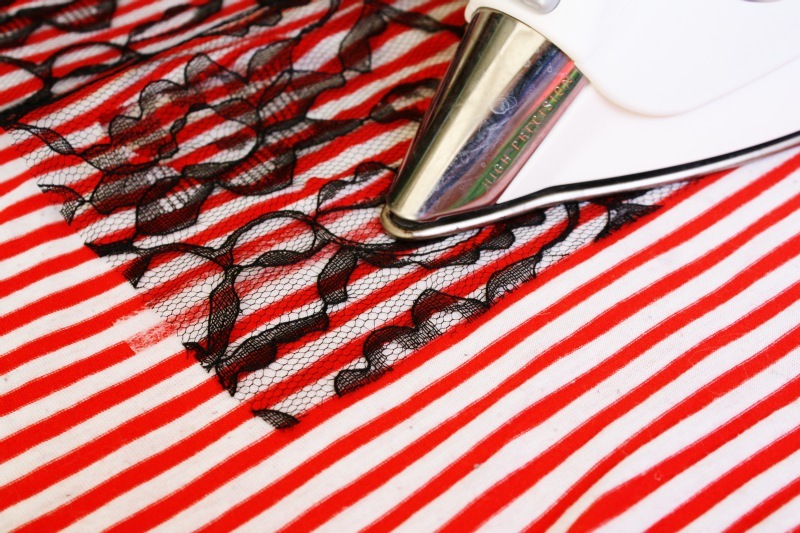 use the stitch witchery (hem tape) to attach the lace per the iron settings on the stitch witchery package – **sometimes placing a damp cloth between the iron and the lace/tape makes it easier. wear it and feel the breeze! 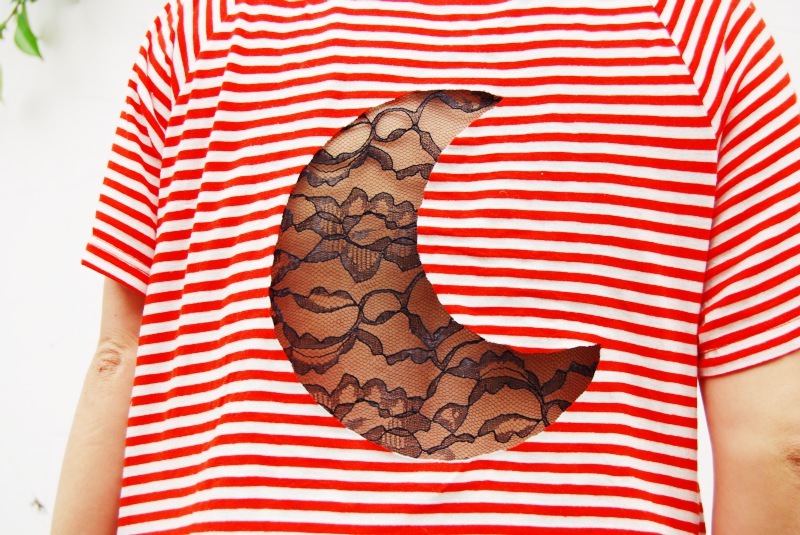 Okay, so this is the cutest idea I've ever seen for a shirt! Hi! So I was wondering, if I wanted to make sure that the shirt didn't curl up where I cut it, what would I do? Would I have to hem it where I cut it? How would I do that? Hi Kate! 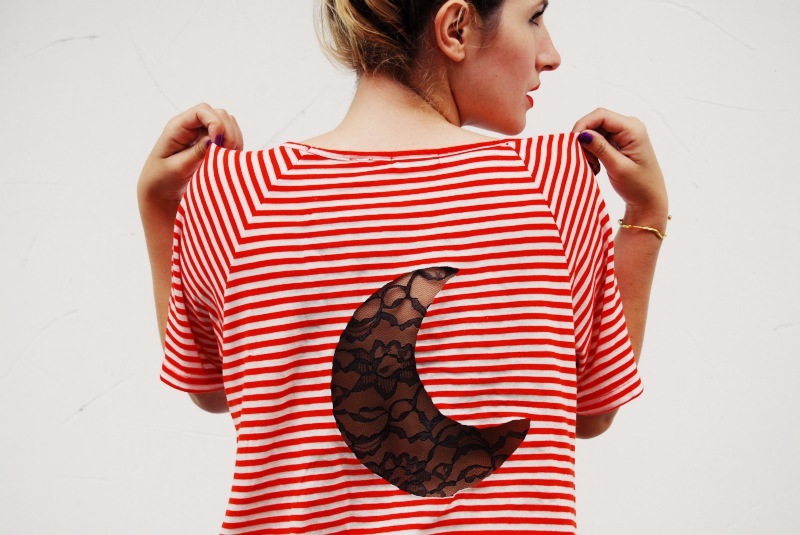 Do you think this DIY would be possible with a knitted sweater? I have one that I never wear because it's just a plain old boring red sweater and I'm trying to to think of ways to spruce it up. The only thing I'm afraid of is the edges fraying and unraveling. use anti- fray glue as you cut, and cut very slowly. 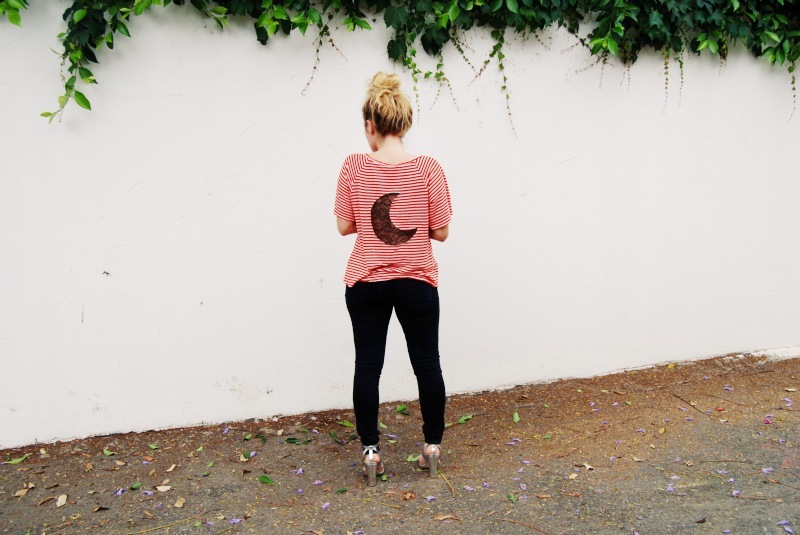 sucha cute and simple idea to add some punch to a basic top!